Qualfon was publicly commended by Guyana’s Minister of Public Telecommunications and Minister of Business for its contact center investments in Guyana, South America. The focused approach you take every single day to your purpose and to this country is very notable indeed. We express our gratitude. Qualfon, a mission-driven business process outsourcing (BPO) company and global provider of contact center services, was publicly commended by Guyana’s Minister of Public Telecommunications and Minister of Business for its investments in the South American country of Guyana. 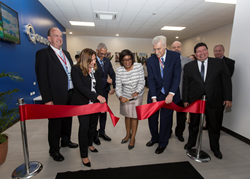 Congratulatory messages were delivered during a celebration marking the opening of the second of three contact center facilities planned at the 10-acre Providence Campus. “I want to congratulate the company on completing another phase of this expansive project. I also want to commend Qualfon on its exemplary track record in Guyana,” said the Honorable Dominic Gaskin, Minister of Business, Republic of Guyana, as he pledged continued support for Qualfon. Known as one of the largest contact center campuses in the world, Qualfon’s Providence Campus features a new contact center, adding 55,000 square feet and 992 more workstations. By doubling its operational footprint at the campus, Qualfon makes way for an estimated 2,200+ job opportunities, 800 of which are expected by the end of 2017. The campus also offers an interfaith chapel, healthcare clinic, as well as “green” features that make it environmentally sustainable. “This creates a huge opportunity for Guyana to capitalize and create more awareness around its customer service capability,” said Kirk Laughlin, Managing Director of Nearshore Americas, a news publication and premier authority on contact center outsourcing in the Caribbean region. “I look forward to watching your country emerge.” Guyana is considered a unique outsourcing destination in the Caribbean region because of its native-English-speaking population and competitively priced services. Over the past five years, industry analysts and investors have taken note, giving rise to the local BPO industry growth. In 2005, Qualfon began investing in Guyana, converting a former textile plant into a contact center. With the initial success of that operation, Qualfon went on to open another contact center as well as the 10-acre campus. As the largest private employer in Guyana, Qualfon employs thousands of people and has a designated Mission Office to care for employees, their families, and the local community. Through a network of services that include free educational and degree programs and humanitarian efforts, the company actively works to make lives better.